A coverstitch machine is essential for the sewist looking to achieve a professional finish. The CoverPro 1000CPX's innovative design is based on the marriage of an industrial-style cover hem machine and a convenient home machine. The resulting union has produced a high-speed, long arm, heavy-duty cover hem machine that looks and operates like a sewing machine. 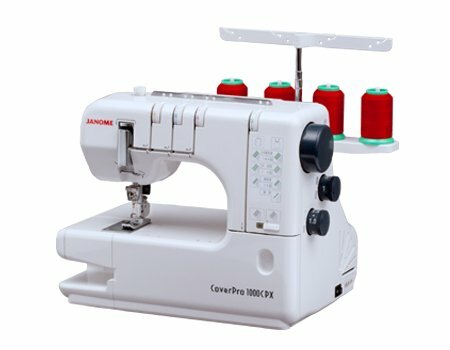 With a wide trip cover hem stitch, exclusive free arm configuration, and Janome's Seam Tightening System (STS), the 1000CPX is the most advanced Cover Hem machine available. Features: Seam Tightening System, Quick reference sticker for stitch selection, Free arm, 1/2/ or 3 needle, vertical needle drop, tension release device, Foot pressure adjustment, differential feed ratio 0.5 to 2.25, Stitch length 1 to 4 mm, stitch width with two needle: 6mm or 3mm, Stitch width with three needles: 6mm, speeds up to 1,000 spm, foot pressure adjustment guide lines, extra large bed space 4"x5.5"